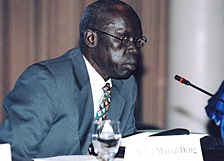 Dr. Nabil Azziz and Dr. Achol Marial live in and love the same country. Both are medical doctors with families and both head health organizations. 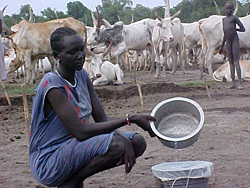 But their country - Sudan - has been torn by a devastating civil war for the past 20 years. Medically, they are united in the fight against Guinea worm disease. The doctors met at The Carter Center in September 2003. "When we meet, we leave politics behind." "In reality, there are no borders in our country, and as medical professionals, we would like to join hands in eradicating the disease," said Dr. Achol. "It concerns us, whether in the north or south. There is no point of difference in the need to pull resources together." "Guinea worm disease has been well known all over Sudan since long ago, and various tribes even have different names for the disease," said Dr. Nabil. "Farmers and nomads are the most susceptible. People know what they should do to extract the worm, but they do it in a primitive way according to the area in which they live. Even before we introduced trained village volunteers and medical kits, they knew what to do with the worm. But they didn't know how the disease was transmitted." Guinea worm disease is contracted when a person drinks stagnant water, contaminated with microscopic fleas carrying infective larvae. Inside the person's abdomen, the larvae mature and grow, sometimes becoming three feet long. After a year, the worm slowly emerges through an agonizingly painful blister in the skin. It's not unusual for a person to have more than one worm at a time, and worms can take up to two months to exit completely. The burning sensation caused by the emerging worm leads many victims to immerse themselves in water, providing relief but continuing the cycle of infection as the worm releases more larvae into the water. Located immediately south of Egypt, Sudan is the continent's largest country, comparable in size to the United States east of the Mississippi River and home to 42 million people of many races, religions, and cultures. 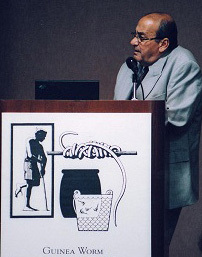 "If you ask someone how Guinea worm disease is transmitted, he will give you his own story," said Dr. Nabil. "Some say it's through eating fish. Others say it's through walking on a place where an infected person urinated. We need to study the knowledge, attitudes, and behaviors of specific groups of people, because different tribes have different beliefs." Using flip charts and posters, village volunteers have helped educate people throughout the country about transmission. "We say, 'Please tell your local people the only way to get infected by Guinea worm is to drink infested water,'" said Dr. Nabil. Also Dr. Achol noted, "We can even use volunteers who cannot read and write. In the south, we can give volunteers pictures instead of tables, and they can mark pictures to show the number of new cases." In addition to education, more than 6 million cloth filters have been distributed for filtering water gathered from drinking sources, and more than 10 million pipe filters have been distributed to nomadic people so they can filter water wherever they travel. Moreover, both doctors agree that surveillance is the backbone of any eradication program. "But to conduct surveillance, you need accessibility to endemic villages that can come only with peace," said Dr. Nabil. "When full peace conditions come, I think we will be able to interrupt transmission in all of the country within five years. Full peace conditions: That is very important." "Accessibility will only come with peace," said Dr. Achol. "I love the people. I love the land. I will always, always be hopeful for the country." A Sudanese woman filters water through cloth to prevent contraction of Guinea worm disease. 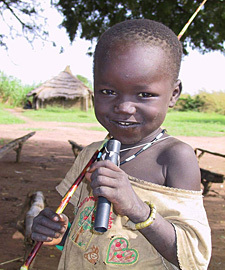 This child holds one of the 10 million pipe filters distributed throughout Sudan.